For more information about templating and how to modify the default templates of the RadControls read the article on different approaches on how to extract the ControlTemplates. [ScrollViewer] - wraps the elements of the RadDataFilter's template and enables scrolling, when the RadDataFilter exceeds the available space. It is of type ScrollViewer. [DataFilterPresenter] - represents the control that wraps the visual elements of the RadDataFilter. It is of type DataFilterPresenter and inherits the HeaderedItemsControl. Root - layouts the elements of the DataFilterPresenter's template. HeaderContent - displays the header of the DataFilterPresenter and is of type ContentControl. Items - displays the items of the DataFilterPresenter and is of type ItemsPresenter. OuterBorder - represents the color of the outer border of the FilterControl and is of type Border. InnerBorder - represents the inner border and the background of the FilterControl and is of type Border. [StackPanel] - layouts the visual elements of the FilterControl and is of type StackPanel. PART_RemoveFilterButton - represents the delete button and is of type RadButton. [StackPanel] - layouts the visual elements for the composite filter and is of type StackPanel. PART_CompositeFilterLogicalOperatorToggleButton - represents the toggle button for the logical operator of the composite filter and is of type RadToggleButton. PART_AddFilterButton - represents the button for adding new filter criteria and is of type RadButton. [Path] - represents the shape inside the button and is of type Path. [StackPanel] - layouts the visual elements for the simple filter and is of type StackPanel. PART_SimpleFilterMemberComboBox - represents the drop down for the available members and is of type RadComboBox. 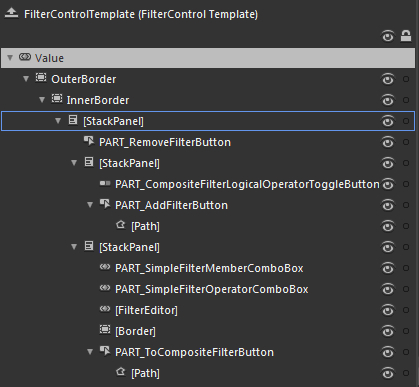 PART_SimpleFilterOperatorComboBox - represents the drop down for the available filter operators and is of type RadComboBox. [FilterEditor] - represents the element for the user's input and is of type FilterEditor. PART_ToCompositeFilterButton - represents the button for creating nested filter criteria and is of type RadButton.